This will be our first time exhibiting at the National Home Show. The dates this year are March 8 to 17, 2019 at the Enercare Centre, Exhibition Place, located at 100 Princes’ Blvd. in Toronto. If you are going, please stop by our exhibit in booth 2543 and say hello. If you are going to IDS19 this year, stop in at booth #548 in the Maker section where we’ll be showcasing our new arbor counter stool alongside our Modern Ming Chair at the Interior Design Show, January 17-20, 2019 at the Metro Toronto Convention Centre, South Building, located at 255 Front Street West in Toronto. We invite you to stop in at booth #O23 to see and touch our live edge Shaker Hall Table at the One Of A Kind Winter Show, November 22-26, 2018 at the Enercare Centre, located at 100 Princes’ Blvd. in Toronto. Come visit us in booth #SN 9 of Studio North to see our new model of the Modern Ming Chair (black with deep red seat and plugs) at the Interior Design Show, January 19-22, 2017 at the Metro Toronto Convention Centre, North Building, located at 255 Front Street West in Toronto. 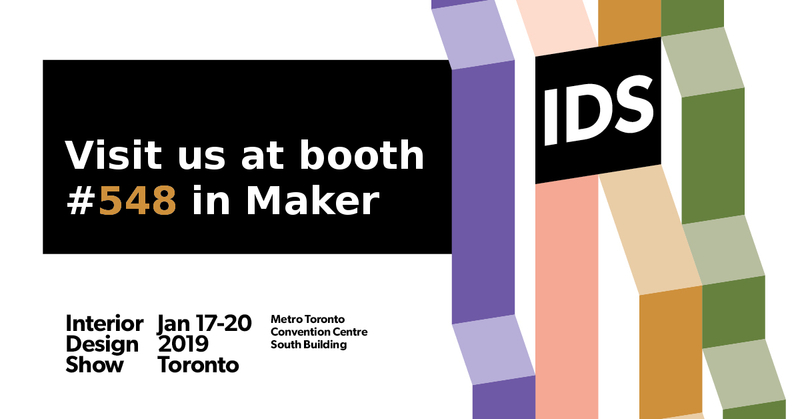 This year IIDEX 2016 is from Wednesday, November 30 to Thursday, December 1. Held at the MTCC, it’s a show for professionals with interests in design and architecture. As an associate of Ontario Wood, we will be part of the exhibit at booth 4211. Click here for details. A great time at the Interior Design Show, January 21-24, 2016 at the Metro Toronto Convention Centre, North Building, located at 255 Front Street West in Toronto. Booth #225. This week, December 2-3, 2015 we’ll be at IIDEX 2015. Held at the MTCC, it’s a show for design professionals only. We’ll again be working with a team of other associates from Ontario Wood. Click the link for details. After the Cottage Life Show, we’ll be working with a team of seven other studio furniture makers from the Toronto area to develop an exhibit for the ICFF (International Contemporary Furniture Fair) at the Javits Center in New York City, May 16-19, 2015. Our exhibit at this show is being sponsored by Ontario Wood. Spring is around the corner and we look forward to seeing you at the Spring Cottage Life Show, March 27-29, 2015 at the Toronto International Centre on Airport Road. We’ll be there as part of a larger exhibit sponsored by Ontario Wood. Hope to see you at the Interior Design Show, January 22-25, 2015 at the Metro Toronto Convention Centre, North Building, located at 255 Front Street West in Toronto. Look forward to seeing you at the 2014 Toronto Fall Home Show at Exhibition Place from September 18-21.